If you're like me and just can't wait for IITF2, dive into the latest episode of In Yr Basement Radio to get a preview of the fun to come plus some unique insight behind the scenes with some of the people who helped put it together. In It Together Fest (IITF, InFestDC, etc.) 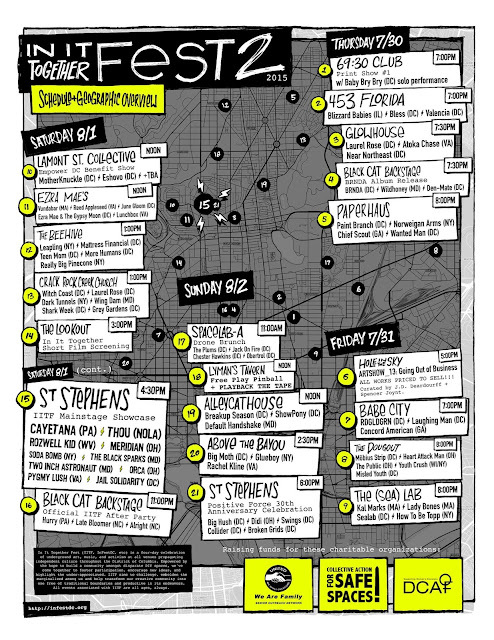 is a four-day celebration of underground art, music, and activism at all venues propagating independent culture throughout the District of Columbia. Empowered by the hope to build a community amongst disparate DIY spaces, we've come together to foster participation, encourage new ideas, and highlight the under-appreciated. IITF aims to challenge, embolden the marginalized among us, and help transform our creative community into one free of traditional boundaries and productive in its endeavors. All events associated with IITF are all ages, always. The two main showcases will be hosted at St. Stephen's, a church that has hosted DIY benefit shows for three decades thanks to Positive Force DC, an activist collective seeking radical social change, personal growth, and youth empowerment. This year we'll be helping to celebrate the 30th anniversary of Positive Force and Revolution Summer with an awesome benefit show with a special endowment from the DC City Council. We Are Family DC ...bringing advocacy, services, organizing, and companionship into the homes of the elderly, while helping to build friendships across boundaries like race, class, religion, age, culture, and sexual orientation. DC Abortion Fund ...an all-volunteer nonprofit that makes grants to pregnant people in the D.C. area who cannot afford the full cost of an abortion. Collective Action for Safe Spaces ...empowering people in the DC metro area to end public sexual harassment and assault. In It Together Fest is proud to uphold a safer spaces policy, vowing to make all venues involved welcoming, engaging, and supportive environments free of oppressive actions, behaviors, and language. Participants and attendees are asked to consider how their language and behavior impacts others in attendance. Racism, sexism, classism, ableism, homophobia, transphobia, and other forms of discrimination will not be tolerated, in tabling material or at the Fest itself at any and all affiliated spaces and/or in materials promoting such events at said spaces. ...but that's not all! 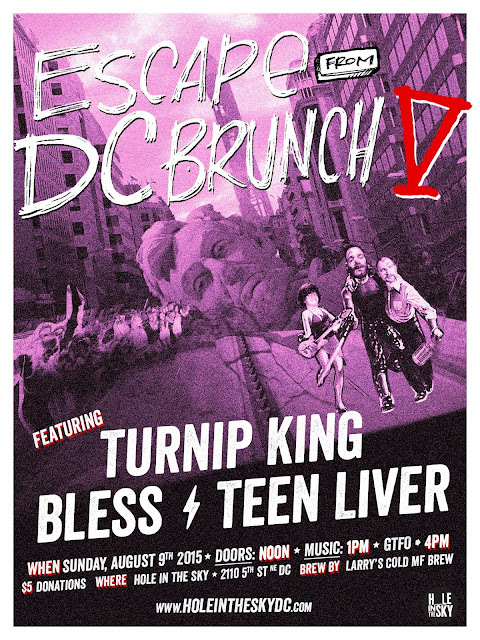 The following weekend on Sunday August 9, don't miss the fifth installment of Escape From DC Brunch at Hole In The Sky, featuring Turnip King, Bless, and Teen Liver - click flyer for details.